Tobins' Tastes: Weekly Shopping Totals Link Up: 20 Bottles of FREE Body Wash & No Food! 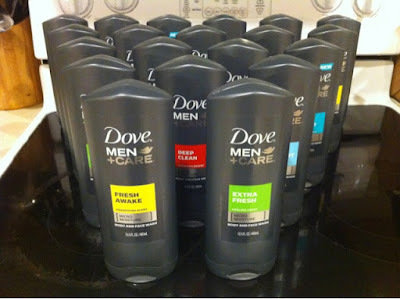 Weekly Shopping Totals Link Up: 20 Bottles of FREE Body Wash & No Food! As you can tell from the photo above, grocery shopping did not happen for me today : ) We have a crazy week and a wedding this weekend so with all the events I really didn't need anything from today's new Publix ad. I am hoping to go on Monday and grab a few things but if I don't we will be just fine with everything we have in our fridge, freezer and pantry. Since we only have one month until our Zaycon chicken order arrives, we are really going to have to get creative in the next few weeks to find ways to eat our way to room in our deep freezer. My plan is to empty both freezers out next week and create a meal plan to use up a good portion of what we have on hand. I have no idea how much room forty! pounds of chicken will take up but I want to err on the side of caution. The only Publix shopping I did this week was to pick up twenty bottles of FREE Dove Men+Care body wash. Twenty may seem excessive (and I definitely had an internal conversation with myself about the purchase) but Justin uses tons of body wash due to his often dirty job and we have plenty of male family members who gladly raid our stockpile too. I just couldn't pass up the chance to stock up on really nice body wash for free. I made sure to hit the sale on the last day the manufacturer coupon was good and I also made sure to leave over ten bottles on the shelf with a variety of scents just in case anyone else was still looking to grab the deal. We did hit up our local farmers' market on Saturday and spent about $10 on produce and a loaf of fresh bread so our total spending for the week was only $10! It has been nice to spend some time eating down our stockpile and saving our grocery cash for wedding related travel expenses.